Judy Vizzari interviews Pam Jenkins, from Diamond Creek. Pam does many things in the local food community, including maintaining the planter boxes in Chute Street. Between Eltham and Diamond Creek is a wide open valley of undulating hills. It’s punctuated by clumps of eucalypts and barbed wire fences and right now it’s a dry expanse of grey-green-gold. Around the valley runs a ridge, topped by a corrugated, brush fringed dirt road which is a less travelled link between Eltham and Diamond Creek. It’s early morning and I’m driving north on the ridge through a veil of dust which mingles with shafted light. As I turn left to skirt the valley I see, on my right, that the land falls away quite sharply into treed slopes which eventually give way to suburban housing nearer the Diamond Creek township. Just below the lip of the ridge on its north side are several large properties – it’s one of these I’m visiting – I’m here to meet local gardener, Pam Jenkins. Pam’s house is a typical 1960s brick home perched between the lip of the road and the steeply sloping valley below. It sits parallel to the street and, like so many local houses, is split level with the top level flush with the road and the bottom level nestled snugly below. There must have been some excavation carried out when the house was built as it, and its narrow front garden, are tucked in behind a slope which leads steeply to the property’s entrance. As I find out later, the garden is an enormous five acres and surrounds the house on three sides – north, south and east – spreading down into the valley below. I glimpse patches of green at the far end of the home and am already sensing the amount of work needed to convert this bushland into verdant oasis. 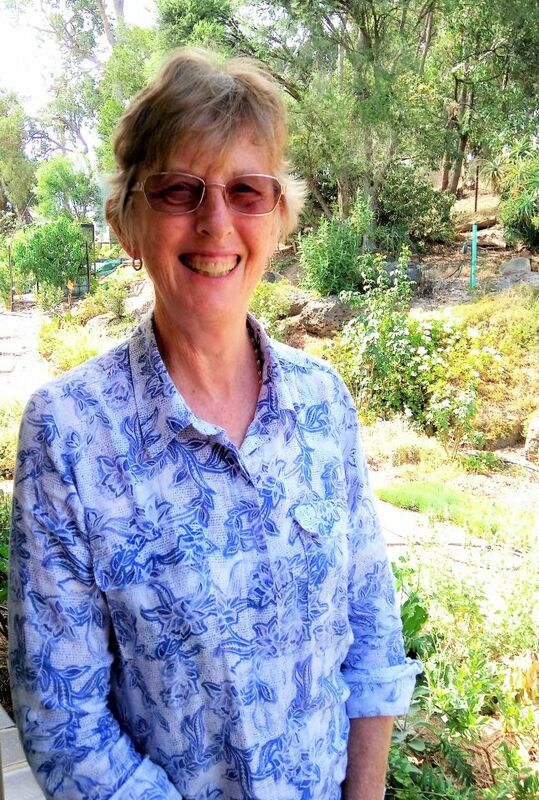 Pam greets me at her front door – she’s a slight, quietly spoken woman with soft grey hair and a ready smile and I soon learn that she’s also a very resourceful one – she has had to be to make the most of her challenging environment. The terrain is, like elsewhere in Nillumbik, rocky, dry and difficult to work – it needs a lot of help to build up a depth of top soil. So she and her family have augmented the beds with compost, manures and mulches, sourced organic materials, added tree and bush clippings and employed complementary plantings to support and nurture the space. Pam’s mantra has been to “use everything at hand” that is, to recycle and to creatively employ all means to make the most of her environment. 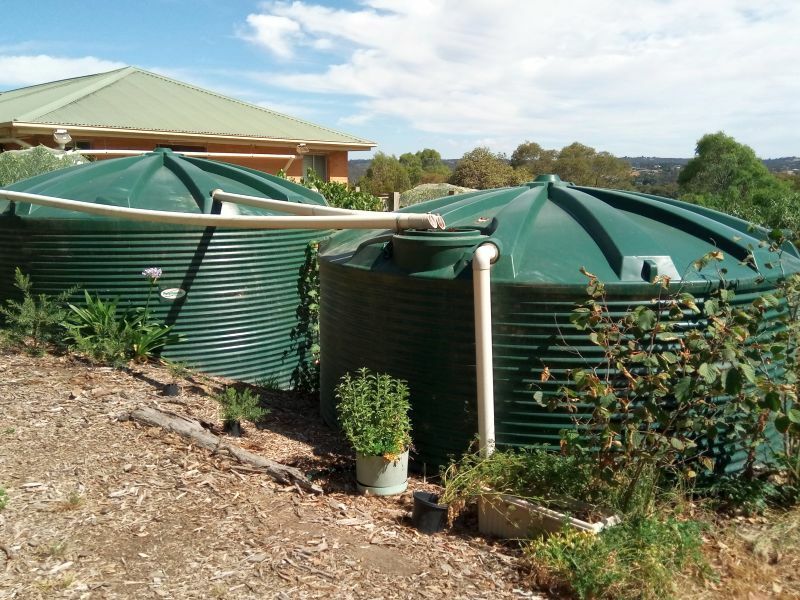 To this end, she has utilised a host of materials including wire, timber, metal, baths, basins, hoses and drums which were left on the property when the family moved here 15 years earlier. She’s even converted a derelict shed into a chicken coop and is presently busy building a ‘summer vacation’ site for the chicks using old wire farm gates and chicken wire – a lovely mobile home for the girls to enjoy! So what’s in this garden? We decide to take advantage of the morning’s freshness so immediately commence by studying the carefully planned and planted front stretch. It’s long and narrow and sculpted away from the house to ensure good drainage and to utilise the runoff. 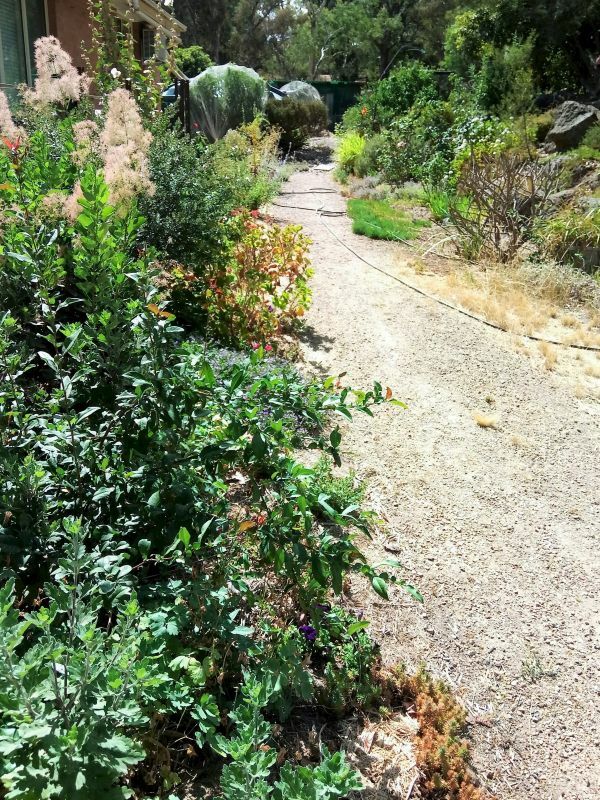 A path runs down its centre and on the street side which is terraced against the steep slope, is a collection of indigenous plants which have been sourced locally. Some appear to be thriving but others are struggling in our harsh summer months. Nearer the house is a cottage garden which, although mid-season and not at its best, contains a healthy mix of edible and decorative plants including herbs, rhubarb, onions, carnations, hollyhocks, daphne, dahlias, canna lilies, a camellia, a hoya, roses, irises and more. 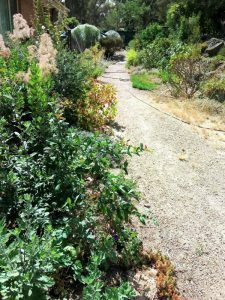 At the east end of the house, we walk up the slope to a collection of nine wicking beds, each devoted to different plantings of in-season vegetables – I see tomatoes, cucumbers, leafy greens, beans, okra and pumpkins which sprawl up over the slope towards the road above. They are interspersed with cosmos and herbs, (many already seeding) and they present a delightful confusion of shades and colours. 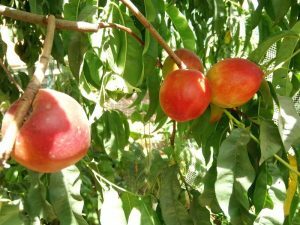 There are fruiting trees here, too, pomegranates, a peach, plum and a loquat. 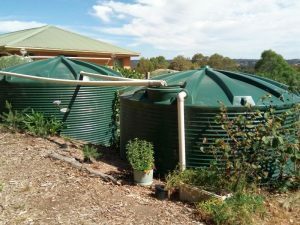 On the lower north side of the wicking beds are two enormous water tanks, each containing 25,000 litres and these are complemented by another 25,000 litre tank further down the hill and another 5,000 litre tank on the slope up behind the wicking beds – enough to keep the entire garden moist during the hottest months. The water is collected from the house’s roof and pumped via a system of hoses to every part of the garden. We take a few steps down past the water tanks, skirt an escapist pumpkin vine decked with enormous yellow flowers, then encounter a most beautiful pergola dripping with great bunches of green grapes. 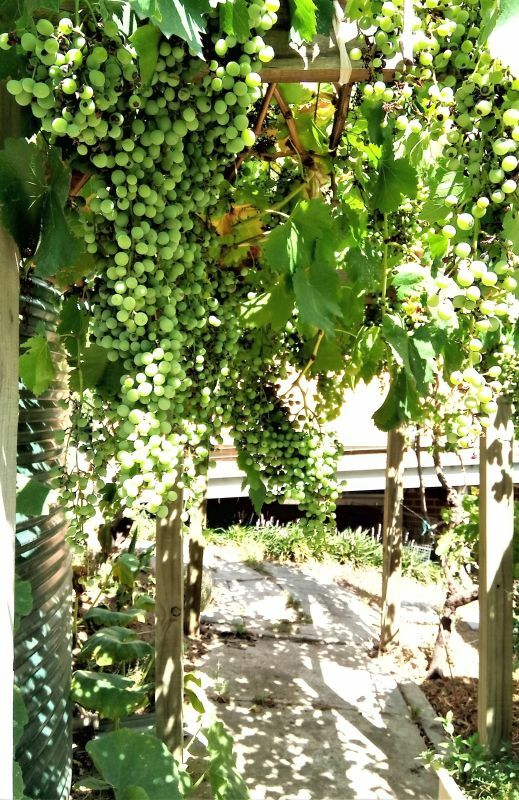 They’re longer than any I’ve previously seen and, despite a blue mould which affects some of them, Pam tells me they will be excellent eating grapes when ripened. 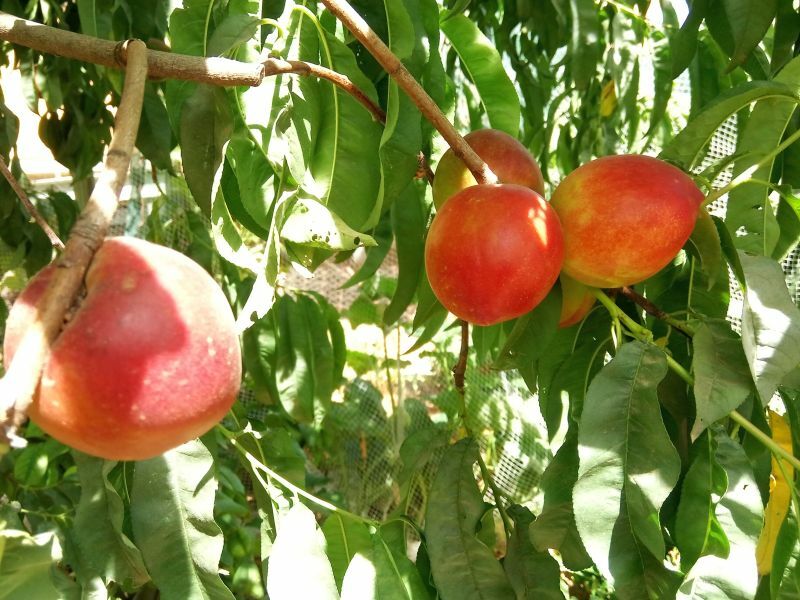 Further on, we find nectarine trees laden with glowing fruit and a peach tree which has already given up its harvest. There are citrus trees (including a finger lime, lemons, limes and mandarins), a fig, espaliered pears, apples and passionfruit vines. Further on again, a windbreak line of feijoas enhances a view which extends onward to the bottom of the property, which is Pam’s husband’s domain. It occurs to me that this garden is a child’s heaven. It has steps and tracks and ins and outs just right for ‘hide and seek’ … it’s just a little wild and unruly, definitely a pleasure garden as well as a practical one. Pam has structured a place rich in produce and fun to navigate. 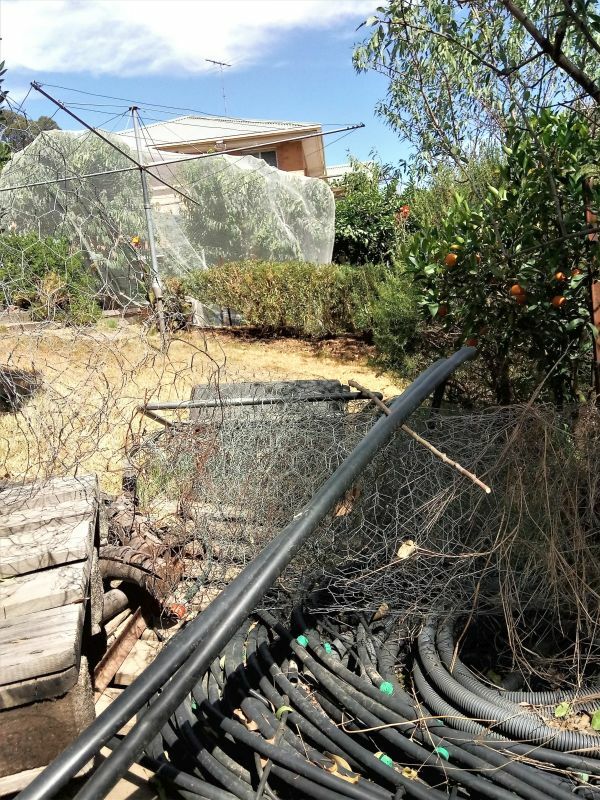 And what of predators – are the plants netted? 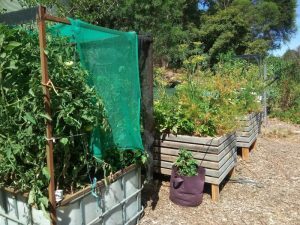 Yes, unfortunately the possums, rodents, birds, rabbits and even kangaroos and wallabies are relentless visitors, but there are miles of netting here and every bit of edible plant is protected. It is an ongoing task to discourage them and not always a 100% effective one, but then, sharing food with locals and local wildlife is natural in Nillumbik. 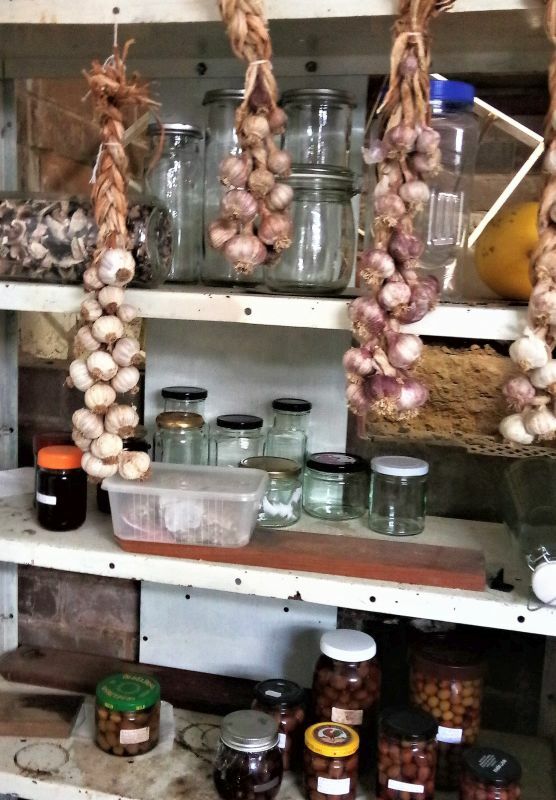 Pam tells me that she always has fresh home produce for her table and what can’t be consumed immediately she preserves – as pickled eggs and vegetables, jam and jellies – and then stores for later use or shares with others. It’s hot mid-morning now so we repair to the shady front verandah with tea and lemon. I’ve heard about Pam’s involvement with two community projects and am interested to hear more. First, she was one of a group who for some time coordinated a monthly food swap in Diamond Creek. Eventually swaps sprung up in other areas and the interest for one in Diamond Creek diminished. She says that during their busy times they were always impressed by the quality, quantity and variety of donations. Even though sometimes more food was received than taken, none was ever wasted. 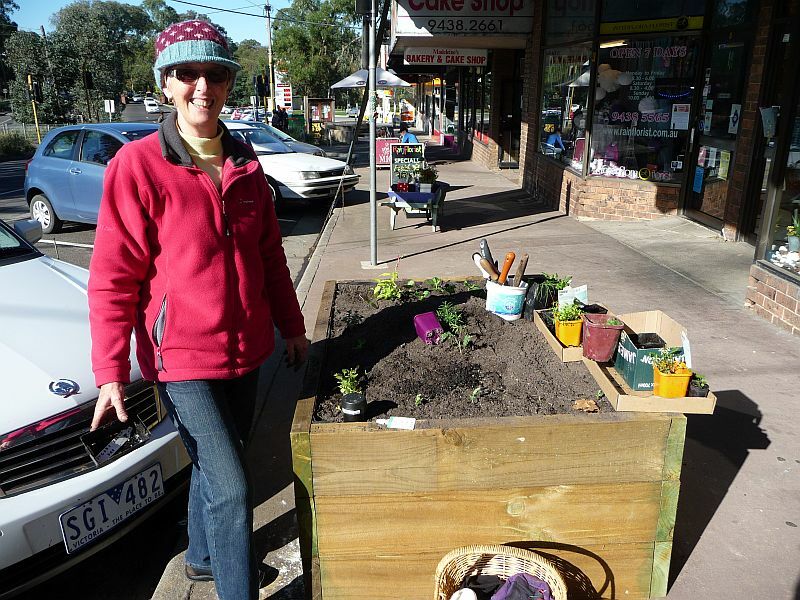 The Chute Street planter boxes (Chute Street is the main road running through Diamond Creek) are a more recent (2014) venture and one which Pam only joined as an occasional helper. Now she finds herself acting as the ‘chief box planner’, coordinating a group of helpers and liaising with the Diamond Creek Primary School. The beds grow a variety of edible plants which are free for passers-by to collect and are maintained by the organising group and, in part, by students from the school. Pam says that she is often amazed by the “enthusiastic and innovative” gardening methods of some of the children and admires their results. The ownership and pride that the Diamond Creek community, particularly the children, take in the project justify its existence. Time to leave after a very pleasant morning. I’m constantly impressed by the energy and resourcefulness of our local gardeners and today I viewed Pam’s garden in very unforgiving circumstances – I was very impressed by what I saw.